The last will of a living testator is a private document. Neither heirs nor spouses have a right to view the will during the testator's lifetime, although she shows it to whomever she chooses. Even the will witnesses view only the signature page of the testament. 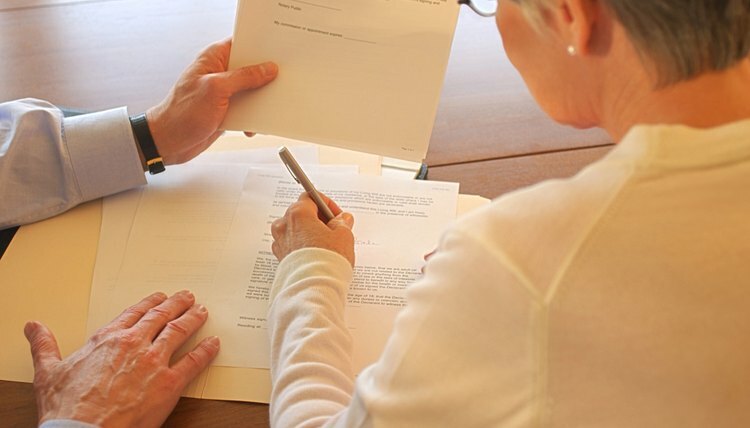 After the testator's demise, the person appointed to administer the will, termed the executor, files a petition for probate, attaching a copy of the death certificate and the last will and testament. From that point on, the will is available for public viewing. The executor files a petition for probate in the superior court of the county in which the testator maintained his primary residence at the time of death. Primary residence is a legal term, determined largely by a person's intent to return. Some people manipulate their primary residence for tax purposes, so it does not necessarily correspond with the place in which the testator spent most of his time. Obituaries and the death certificate often list the county of primary residence of the deceased. During probate, you view a last will and testament at the courthouse. Some courts provide Internet sites or dedicated telephone lines with updated probate information; use these to confirm the location of probate and to obtain the case number. Any member of the public accesses the probate file by providing the court clerk the probate case number or the full name and date of death of the deceased. The will is among the first documents in the file. Courts retain wills after probate and they remain public information. View a recently probated will in the same manner as one currently in probate, by providing information about the deceased to the court clerk. Courts generally store older wills in archives. Ask the court clerk for the procedure for accessing archived wills. Some courts bundle many old wills together in large folders, arranged alphabetically or chronologically; you sift through original documents for the relevant will. Other jurisdictions store older wills on microfilm.